I know that this is likely a longshot, but I wanted to put some feelers out there and see if anyone would be interested in doing a straight trade with their front-valve Eb tuba for my custom Besson 981 Eb. By custom, I mean that this horn has a Conn 4J bell attached to it, which tightens up the sound just a little bit. It is an older Besson 981 with the original British shank, but it plays well in tune and works fantastically with the Denis Wick Brit shank mouthpieces. The tuba would come with an Altieri gig bag and Besson hard case. I would also throw in either a Denis Wick 2 or 3--if I were to trade, I wouldn't need those Brit shank mouthpieces anymore, so it's your choice. Horns I am interested in: any of the Willson Ebs, the Miraphone Norwegian Star and Star Lights, the Perantucci PT-22P, Meinl-Weston 2141. At this moment, I am not interested in the Besson 983 Eb tuba--I already know that having to anchor the fourth valve down with my pinky while doing anything in the low range would be cumbersome and awkward for me. Lately, I've been having some carpal tunnel issues with my left hand, and I'm starting to think that maybe a switch to using all tubas with front-facing valves might be just what the doctor ordered. More pictures are available on request, but here's a headshot featuring the tuba and a video of me using the horn. The blue tape in the picture is just racket grip tape, which I used to use in order to improve the grip on the sides of the horn. Last edited by AHynds on Sun Dec 09, 2018 11:07 am, edited 6 times in total. I like to make weird and non-weird sounds with metal pipes and computers. Why not a Nirschl EEb 4 plus 1, same bell diameteter but larger bore: o.803 inches. Great look, great sound.. My now preferred EEb horns are both 4 plus 1 York and Willson 3400.. Thus the Nirschl sits in the c order but in its gig bag. Interested? Mines not for trade, but I'll defenitely advocate for holding out/ saving up for a Willson. 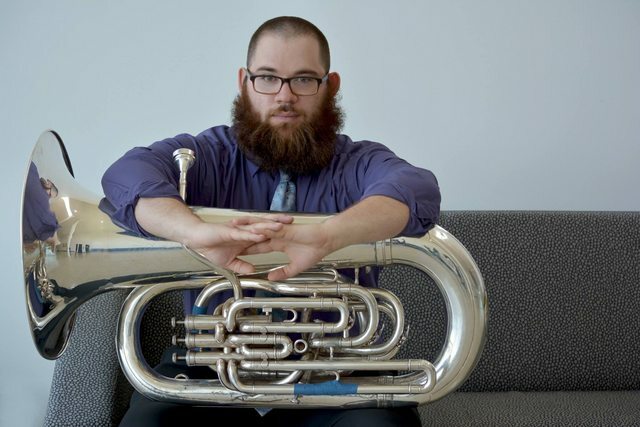 After hearing what Marty Erickson could do on it, I decided it was the horn for me and it is an absolute joy to play, and I have not once had a fellow tubist try it and be unimpressed. How often does the Nirschl 4P1R pop up for sale? I can't say I've ever seen one for sale, at one point I was looking for one.